Conspiracies were for pasty forty-year-old dudes living in their mom’s basements sporting aluminum hats, studying the stack of hardback books with titles like “We’re Not Alone” and “The Real Twilight Zone” sitting on their TV trays. The intrigue and sensuality are heating up but I have more questions than answers after reading this installment. The plot thickens! This is book 2 in this trilogy and book 1 must be read before this one. After the first packed full book this one didnt disappoint. I found this one a bit slow, totally necessary for the story, just not as much reveiled as Id hope and not too much action. 4.0 out of 5 starsI need the conclusion to this story ASAP! More twists and turns, some questions answered but I am completely itching for the conclusion of this epic story! 4.0 out of 5 starsAngst-filled continuation of this forbidden romance! This continuation of the Protocol series is angst-filled while the heat between Cruz and Lia is turned up high! Picking up right where we left off in Against Protocol, our former first lady and her bodyguard truly can't keep away from each other. But even their small window of bliss is just the beginning with what I fear will be one heck of an explosive finish. I like that the Author has portrayed Lia and Cruz as two very professional people where it counts but who still have that need, that desire for each other that just won't go away. Their lives will be forever intertwined and it's truly now a race against time to stop those hellbent on finishing the job they started by assassinating the President. The way Cruz and Lia are throwing caution to the wind, with long-held feelings laid bare for the first time, I have to wonder just how it will all turn out for them. With a jaw-dropping revelation right at the end of this book, my heart hurts for both of them, tangled up in a conspiracy that may well finally be their downfall. Continuing to love the Author's writing style, giving us just enough to whet our appetites for more, please bring on book 3! 5.0 out of 5 starsGreat characters, great story! 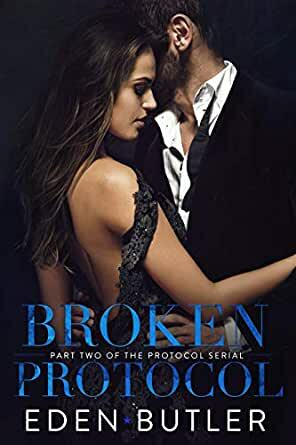 This is the second instalment in the Protocol series by Eden Butler since it continues on where Against Protocol left off you need to read that one first. It has the same great characters with totally hot chemistry but a bit of a different feel as this story is really coming together. This one is dangerous, worrisome. There’s a twist, some secret we still don’t know and I can’t wait to find out what it is. I love that Cruz and Lia’s story goes back and forth between their past and present. Seeing them together in the past helps strengthen the depth of their connection. I’m rooting for them…the twist….He’s so protective and possessive of her, I can only imagine it’s a secret kept to keep her safe. She knows he can’t answer her questions, which is a bit unsettling at the moment; she needs answers just like me. With the unanswered questions and yet another cliffy, I’m so glad to be able to dive right into Final Protocol. With that, I’m off….going in. Eden Butler you slay woman , Oh my gods this book just WOW Broken protocol can't be read as a standalone so get the first book in the Protocol series as soon as possible and while you are at it one click this baby you wont regret it . My heart was slowly speeding up through out the story while secrets were revealed and then bam cliffhanger my heart is going cra cra but it's not surprising because that is what the author does boom. Part 2 of the Protocol series is absolutely amazing! It is filled with angst and keeps you sucked in! It picks up right where book 1 leaves off, so if you did not read the first installment I really suggest doing so! This again is a shorter read and it is absolutely worth every second of your time. Our former first lady and her bodyguard can't keep away from one another and are sure keeping me on my toes. I am enjoying every second of reading about their bliss together and I am expecting one explosive outcome to this series. I really like both of these characters and that's very rare for me. I normally like one character more than the other or I despise one for awhile and then start to enjoy them. In this series I have liked both of these characters equally throughout each book. I love that they are professional when it counts, and throw caution to the wind at other points.